Though we proudly emblazon this blog’s tagline as “All glitz, no glamor,” we could just as well call it “A distortion of reality.” Much of the alley photography featured on this blog – in locations that can be downright frightening – toe the line between eerily gorgeous and just plain pleasant. Today’s picture is no exception. 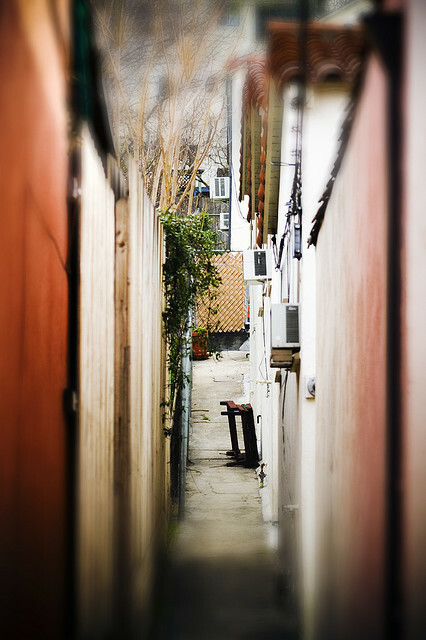 You might not want to get caught late at night here, but we love the look and feel of this alley. This shot exemplifies Los Angeles Alleys because it literally blurs a local alley while vividly capturing the stark red foreground and staying true to its surroundings by showcasing an unused, discarted something that is a mainstay of local side streets. The image…was shot in Silver Lake during a walk up aside street, I don’t recall which. I am a professional photographer, and am almost always with my camera -I feel a bit naked without one, actually. Street photography and shooting the “hollows” of cities has always been an interest of mine. For more alley action, follow us on Twitter.